MINNEAPOLIS (January 30, 2013) – Carlson Rezidor Hotel Group, one of the world’s largest and most dynamic hotel groups, announced today the findings of the 2013 International Travel Trends Survey. Conducted by Kelton, the survey queried more than 1,000 Americans ages 18 years and older, and reveals important information on the latest trends in the hospitality industry. The findings revealed the frequency of and spend on travel, brand loyalty, feelings about hotel food and beverage options, and the importance that technology plays in making accommodation decisions. The survey found domestic leisure travel to be the most common reason for travel, with 55 percent of Americans having flown or taken a road trip somewhere within the United States during the past 12 months. Those who traveled domestically in 2012 took an average of four U.S. trips, and international travelers averaged two trips out of the country. The most popular international destinations for the last two years have been Canada, Mexico, and the Caribbean, with 45 percent of international travelers visiting these spots. Europe followed suit with 29 percent. Findings indicate that males have visited more countries in their lifetime than women, averaging eight and six, respectively. Individuals with a household income of more than $100,000 have traveled to an average of nine countries in their lifetime, those earning $50-$99,000 have visited an average of seven countries, and individuals earning less than $50,000 have traveled to five countries. Younger Americans tend to have more of an interest in traveling abroad. More than half (51 percent) of Americans ages 18-44 who have never traveled outside of the U.S. plan to do so in the future, compared to 25 percent of those 45 and older. Americans who traveled domestically in 2012 for leisure spent an average of $344 each day. Unsurprisingly, almost half (42 percent) of Americans who have not traveled around the U.S. in the past year say it is because they are trying to stick to a budget. This is similar to the 39 percent of individuals who did not travel internationally in 2012 for the same reason. Nearly a third (29 percent) of respondents who did not travel in the U.S. felt that traveling by car and taking a road trip has become too expensive due to the high price of gas. 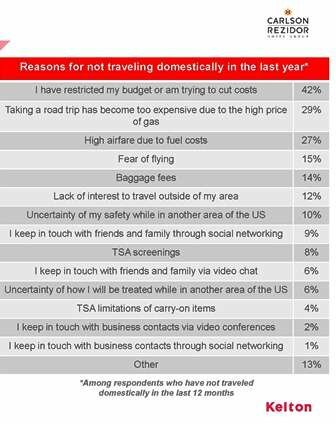 Twenty-seven percent of respondents decline to book flights due to rising airfare fuel costs and 14 percent of respondents feel they cannot justify the baggage fees. When it comes to booking travel experiences, there is no stronger influence than the power of word of mouth. Forty-one percent of survey participants who traveled for leisure in the last year noted that a trusted source’s description of a past vacation experience has the greatest impact on their decision to book similar arrangements. Social media outlets, such as TripAdvisor, Facebook, Twitter, and Instagram, have a particular draw for Americans ages 18-34 when making travel decisions. Twenty-nine percent of respondents ages 18-34 are impacted by these digital influencers, compared to 10 percent of respondents ages 35 and older. Nearly a quarter (24 percent) of individuals ages 18-34 are impacted by a hotel’s packages, while only 12 percent of individuals ages 45 and older take note of the inclusive offerings. Twenty-two percent of individuals ages 18-34 are impacted by a discount or deal website, such as Groupon or LivingSocial, compared to 11 percent of individuals ages 35 and older. 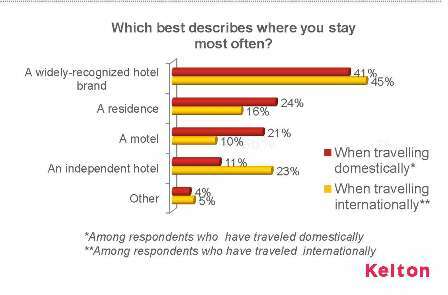 When booking a hotel or resort, Americans like the safety of widely recognized brands when traveling domestically and internationally, over alternative lodging options such as staying at a friend’s or relative’s home; a motel; or an independent hotel, such as a bed and breakfast or boutique hotel. Income plays a role in choice of stay. While traveling domestically for leisure, 70 percent of individuals with household incomes more than $100,000 prefer a widely recognized hotel chain or brand, such as Radisson, compared to 36 percent earning less than $100,000. International leisure travel reveals similar findings. Over half (56 percent) of individuals earning $100,000 or more prefer a widely recognized hotel chain or brand, compared to 43 percent of people earning less than $100,000. More than one quarter (28 percent) of Americans believe hotel restaurants have improved in recent years. In fact, when it comes to dining while traveling, 61 percent of Americans would prefer to eat all, or at least some, of their meals in the hotel restaurant or through room service. Income level impacts opinions of hotel food and beverage programs. Fifty-nine percent of those respondents with a household income of $100,000 or more stated that they would like to eat at a hotel restaurant if it received impressive reviews (AAA or Zagat), even if they were not staying at the hotel, while 28 percent of those who earn less agree. Similarly, celebrity chefs are still popular amongst individuals with higher incomes. 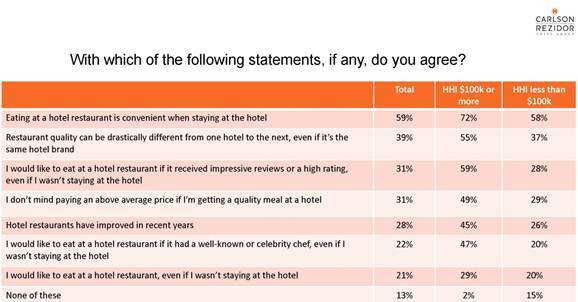 Forty-seven percent of those earning $100,000 or more would like to eat at a hotel restaurant if it has a well-known or celebrity chef, even if they were not staying at the hotel, compared to 20 percent of respondents making less than $100,000. Hotel technology options are particularly important for Americans ages 18-44 when booking accommodations. More than 90 percent (93 percent) in this age group would be likely to look for availability of gadgets or technology when selecting a hotel, compared to 70 percent of those 45 and older. Seventy percent of Americans look for availability of free Wi-Fi when selecting a hotel. This is important to 79 percent of travelers ages 18-44, compared to 59 percent of travelers ages 45 and older. Twenty-seven percent of travelers look for accessories such as chargers and speakers; at 35 percent, this too is more important to individuals ages 18-44 compared to 18 percent of individuals ages 45 and older. Gaming consoles are a desired amenity to 18 percent of all respondents; 28 percent of those ages 18-44 are interested in the availability in Xbox or Wii at their hotel of choice, compared to five percent of respondents ages 45 and older. Additionally, 17 percent of all respondents look for access to electronic tablets, with 23 percent of respondents ages 18-44 noting that this is important,; only 10 percent of respondents ages 45 and older crave access. The Carlson Rezidor Travel Survey was conducted by Kelton between January 2-8, 2013, among 1,072 nationally representative Americans ages 18 and older, using an email invitation and an online survey. Quotas are set to ensure reliable and accurate representation of the entire U.S. population ages 18 and older. The margin of error is +/- three percent. The sample size is 1,072 nationally representative Americans ages 18 and over. Results of any sample are subject to sampling variation. The magnitude of the variation is measurable and is affected by the number of interviews and the level of the percentages expressing the results. In this particular study, the chances are 95 in 100 that a survey result does not vary, plus or minus, by more than three percentage points from the result that would be obtained if interviews had been conducted with all persons in the universe represented by the sample. The margin of error for any subgroups will be slightly higher. Full survey, topline results, and additional infographics are available upon request.